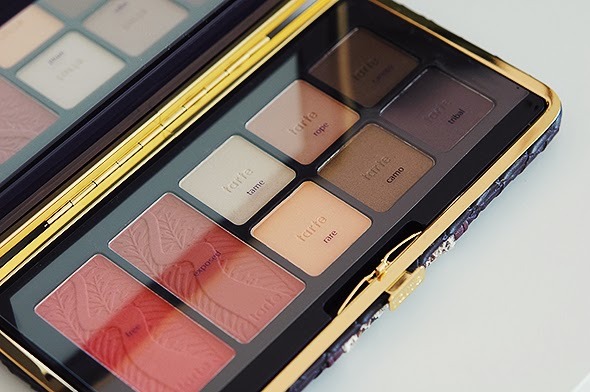 When Roses Beauty Store added a whole heap of Tarte products to their website I just couldn't resist. I've been really getting into palettes as of late and the Amazon Escape made a very warm welcome into my ever growing collection. Blusher in Free - Bright orange based coral, very pigmented and requires a light hand. Blusher in Exposed - Dusky rose, office-friendly despite the high pigmentation. Eyeshadow in Tame - Shimmery bone white, beautiful highlight shade. Eyeshadow in Rope - Matte beige, great for a base. Eyeshadow in Canopy - Rich chocolate brown, intensely pigmented. Eyeshadow in Rare - Subtle warm peach. Eyeshadow in Camo - Shimmery olive brown, very rich in colour. Eyeshadow in Tribal - Deep plum, requires a light hand. One thing that was consistent for me among Amazon Escape was pigmentation. All of the shades impressed me, particularly Rope, which evens out the colour on the eyelid brilliantly. My favourite of the bunch has to be Camo, it works exceptionally well to create a beautiful bronzed look on the eyes without overdoing it. Out of the two blushers, Exposed is the most flattering on my skin. While Free is a great colour, it just doesn't work for me. I found that both the eyeshadows and the blushers lasted 8+hrs without fading or creasing, something I really look for in makeup. 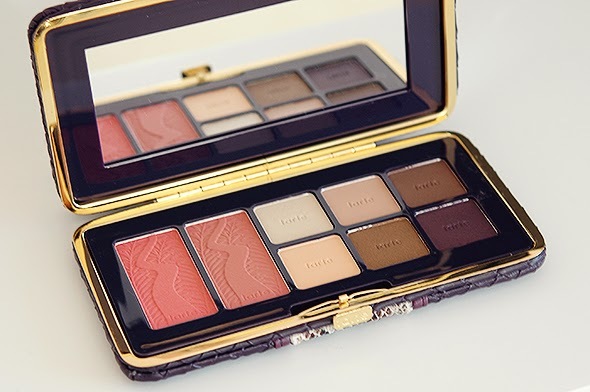 Those of you with an extensive eyeshadow collection probably won't need this palette as the majority of the shades are dupable, however the quality is outstanding and makes it well worth the price. If you're interested in US beauty products and don't have a trip planned anytime soon I'd really recommend Roses Beauty Store - while some items are slightly overpriced compared to their dollar equivalent, if you're really after something it's worth it! I need everything else from the holiday collection too haha! This is so gorgeous! Love all the shades, so pretty. I know what you mean, I have no idea why they put them up substantially and I noticed they're selling the Bath & Body Works Pocketbacs for £7.99 each! Some of the prices are just so confusing but I'm glad this is still reasonable! I really wish it was more accessible over here, it would be amazing! Gorgeous shades on your eyes! It looks gorgeous! Was delivery times/costs ok?